We are very lucky to be on the water’s edge here in Bellingham. We have Bellingham Bay to our west, Lake Whatcom on the eastern part of town, with Lake Padden and Emerald Lake in town and Lake Samish, Cain Lake and Reed Lake in the southern part of the county. In the north there’s Birch Bay, Drayton Harbor, and Sandy Point, all salt water sites, Wiser Lake and The lake in Birch Bay Village also in the north County. The city of Blaine sits on Boundary Bay and Semiamhoo Bay. The Nooksack River runs through Whatcom County, and there are numerous streams and creeks, most notably Whatcom Creek running through Bellingham. There are numerous smaller mountainous lakes like Pine and Cedar Lake in the county as well. 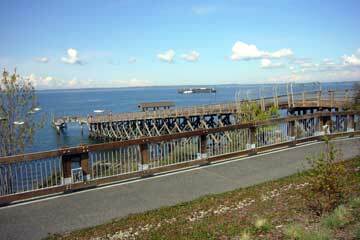 Yes there is an abundance of Waterfront Property here in Bellingham and Whatcom County, and much of it has fantastic homes along the shorelines.